Papillon Bleu UK: Found it!!!! First of all, I would like to thank you all for your wonderful words . Once again you've proven how strong our network support is on Blogland and that blogging is deep, real, enriching, constructive , fun and full of wonderful people with generous hearts. I am so proud to know you all. I have followed ALL your advice: eaten chocolate , done some physical work cleared up the snow in the lane, walked dogs at the rescue centre ( I have just registered as a vonlonteer and it is one of the best things I have done ever! ), read, watched films I loved ( even scary ones! ), and have discovered new fascinating blogs. Then, I started drawing, drawing, drawing...I just couldn't stop! And a new little doll came to the world. Then a second, and now a third is on her way. 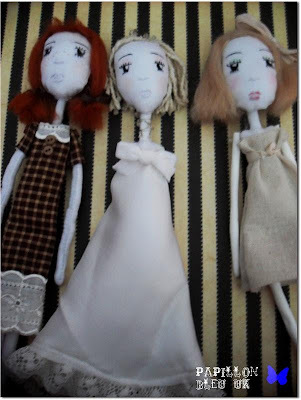 The doll in the middle is the doll I am making for the Mini ADO challenge Jack Frost. 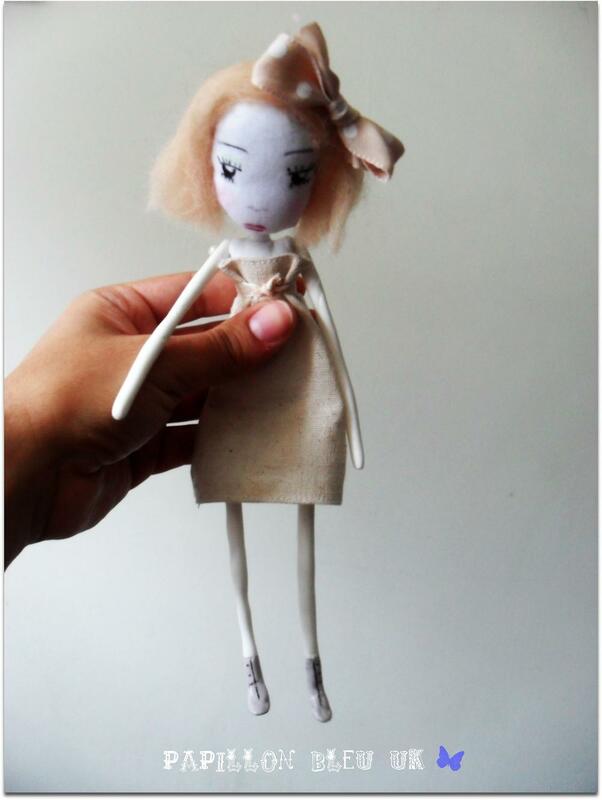 I have to say I am a bit nervous because these dolls are very different from what I have shown you before. 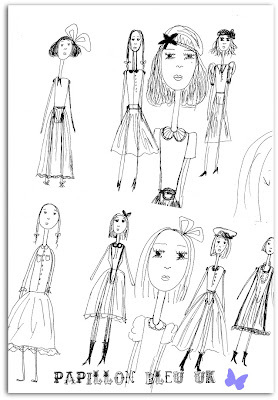 They are closer to what I use to draw when I was a teenager when I use to buy Designers/Haute Couture magazines. Discovering Andrew Yang's Kooklitas ( link in sidebar) just brought this memory back I guess. I have called this series: Les Elégantes. youpiiii, ça fait vraiment plaisir. tes jeunes élégantes sont ravissantes. elles me rappellent l'époque où jeanne voulait que je m'achète des chaussures à talons pour qu'elle puisse "damer" (qui signifiait "se déguiser en dame"). plein de bises. wonderful dolls !!!!!!!!!!!!! don't stop !... keep going ! ...have fun ! You have your mojo back, hurrah! Your girls are wonderful, congratulations. I can't wait for their little film. I'm still looking for mine... While I'm tidying up the studio. Génial! Je suis tellement contente de voir que l'inspiration est revenue et j'adooore tes nouvelles poupées. Elles me plaisent vraiment beaucoup. Bravo! I love your new dollies!! I agree with Sandy..don't stop..they're awesome!!! ps. I received the cotton candy and goodies..Lucy loves them!! I will take pics and post soon. Thankyou!!! Charming delicate little Dolls :-) Like the new look on your blog too. Appereantly we had both lost something and I'm very glad we both found it back. OH DEAR, OOOOOO, YOU HAVE CAPTURED MY HEART WITH THESE POUPÉES!!! Lovely, lovely Papillon Bleu, thank you for coming to visit me! Oh, how are you dearest fairy? This is a magical time of the year and even more so with people like you who BELIEVE IN ALL THAT IS LOVELY.....thank you for coming by! Now I shall be looking for mine :). But I have no doubt it's just lurking like yours did . And what a comeback for you, dear Patricia, like I said, stronger than before. Your dolls are exactly how I love mine. 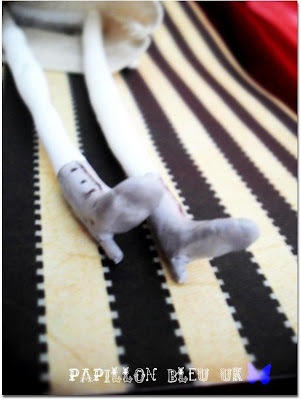 Stick tall with long skinny dangling legs :). Patricia, I love them so much and the name you have chosen for this series is perfect. They are delicate, sweet and elegant. I am so happy you got your mojo back, these dollies are precious! I love these dollies. So very sweet!